Encompassing parts of Routes 26 and 35, Mt. Hood Highway circles the southern side of majestic Mt. Hood to connect Troutdale with Hood River, offering awe-inspiring scenery and a taste of Oregon rural life. The Mt. Hood Scenic Highway begins 16 miles east of Portland where the Troutdale Bridge crosses the Sandy River. The byway makes a natural loop around the south side of Mt. Hood. 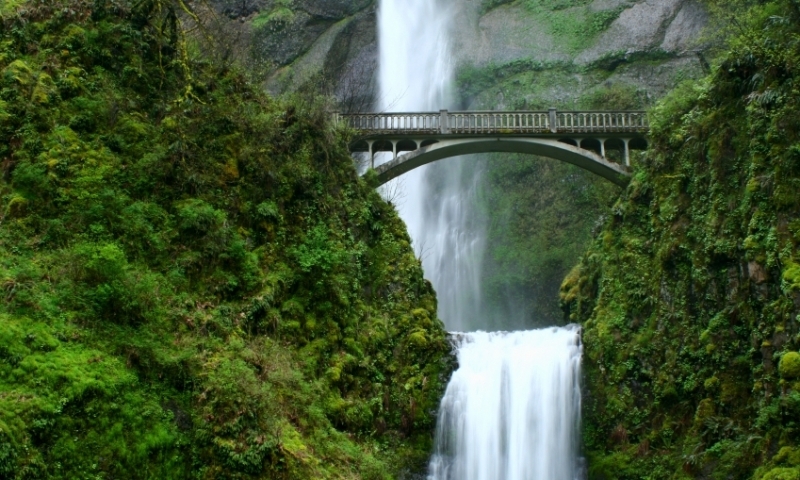 Pass diverse landscapes and enjoy the picturesque Oregon communities along the way. Traveling from Troutdale to Hood River via a southerly loop around Mt. Hood, the Mt. Hood Scenic Byway passes through some of Northwest Oregon’s most beautiful landscape. From tall verdant rainforest, through the Cascade Range uplands, through the golden orchards of the Hood River Valley, this scenic drive showcases the Pacific Northwest at its best. From Portland, take Highway 26 east to the Sandy River. Take Exit 18 to the Sandy River Bridge, turn right to cross the bridge; this is where Mt. Hood Scenic Byway begins. The route takes the Historic Columbia River Highway through Wood Village and Gresham, then heads west with a right turn on Highway 26 in Sandy. Heading around Mt. Hood, the route passes through the Mt. Hood Villages. Turn left on the Highway 26 business loop; go through Government Camp and onto Timberline Road. Continue east on Highway 26 from Timberline Road, then take Highway 35 north through the Hood River Valley and into Hood River. Total length of the Mt. Hood Scenic Highway is 105 miles. The route can be driven in about 3 hours, but allow at least 8 hours to fully experience the attractions along the way.